India’s largest mobile manufacture company Micromax recently launched a new brand model Micromax Canvas 5 special edition which is launched in august 2016. This smart phone has 5.00 inch screen which is perfectly for your pocket size and has a resolution of 720 by 1280 pixels. Micromax canvas 5 Lite special contains a brilliant 1Gz quad core processor with mediaTek MT6735P processor and with 3 GB RAM. This phone is beautifully designed by rare wooden panel that increases its charm. Back wooden panel of this phone give it a new adorable look. Internal storage of this phone has huge amount of space with 16GB along with Micro SD card which can be smoothly expendable up to 32 GB. Micromax Canvas 5 lite special edition has a rare camera of 8.00 mega pixels with flash and 5.00 front camera for self shooters which is really worthwhile for your budget. This phones is powered by 2000 MAH battery which is removable and the android version is 5.0. Go for Ebay coupons and you will save money while buying this. Micromax Canvas 5 lite special edition is dual SIM smart phone (GSM + GSM) with micro SIM and also with 4G LTE enabled Wifi, GPS, FM many more features can be seen in the phones which is used for the daily basis in our life. Along with this features Micromax canvas 5 lite special edition contains proximity sensor, Gyroscope, Ambient light sensor. Camera specification: In today’s every phone company is at its peak because of its camera quality but or Micromax Canvas 5 Lite special edition has a powerful camera of 8 Megapixel primary camera and also have 5 megapixel for rare shooters. The fine flash of this camera easily capture the photo at low light or in the dark. Self timer option in the phone is really usable when you capture with your siblings. Many other options in Micromax Canvas 5 Lite special edition makes your phone worthwhile to buy according to your budget. Phones battery: The long day battery of this phone is 2000 mAh which can easily used throughout the day. Phone contains removable battery and you can remove it easily anytime. Android version: Micromax Canvas 5 lite edition comes with lollipop android version of 5.0. SIM Slot: This dual sim phone has a slot of micro SIM which can easily put in your phone. This phone is 4G Lte enabled which boost the speed of your internet surfing. Processor: Micromax Canvas 5 lite phone comes with superior processor. 1Gz processor boosts its power and it has MediaTek MT6735P processor. Phone Resolution: Micromax Canvas 5 Lite edition’s screen has a resolution of 720p by 1280p. This HD resolution is better for gaming, watching videos and many more. Ram and Rom: Micromax Canvas 5 lite special edition is powered by 3Gb of ram and 16 gb of rom. This phone can be expendable with Micro SD card up to 32 GB. You can easily upload or download more songs and videos in your phone with your SD external card. Design and look: This 5 inch screen phone beautifully design by back panel which gives your phone a unique look. The back panel of this phone design by wood lite back board. Other Features: Many other features of this phones are ambient light sensor, gyroscope, proximity sensor, FM, Wifi , Bluetooth, GPS , W-GPS, Edge, 3G, 4G LTE. 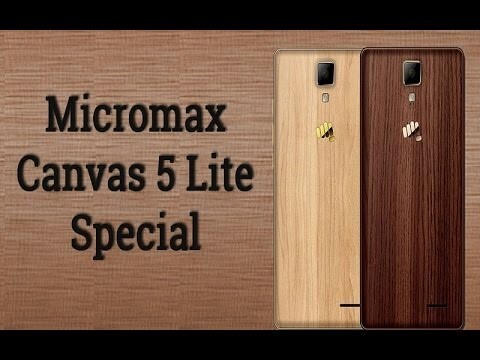 Micromax Canvas 5 Lite special edition comes with an affordable mid price range. You can buy this phone through online shopping or retailer shop easily. In the box you will get manual book, charger, ear phone and handset.